Frog Log/FrogLog is a swimming pool escape ramp for frogs. The Froglog also helps toads, lizards, mice, chipmunks, squirrels, ducklings, turtles, bugs or insects, and other small animals up to one pound. 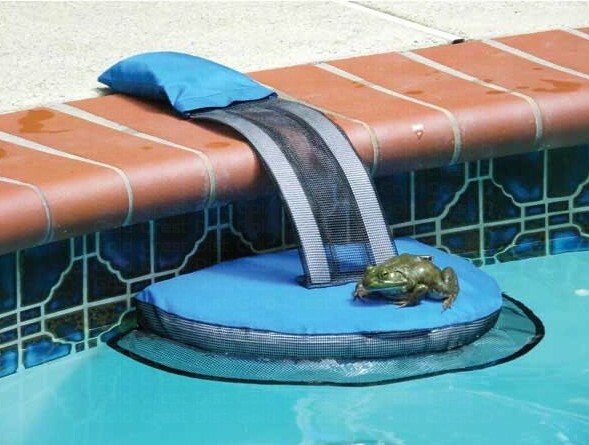 The FrogLog saves native wildlife, keeps pool water clean, and reduces time spent on pool maintenance. The FrogLog can also be used in other water features including hot tubs or spas, backyard ponds, and fountains. Once a frog, mouse, or other animal falls into a pool, they instinctively swim toward the pool wall trying to escape. The animal will circle around the edge of the pool looking for a way out. The animal will bump into the FrogLog, climb up the platform, climb the mesh ramp, and exit the pool. Turning the pump and filter to cycle off at night will improve the effectiveness of the FrogLog. If the pump runs all night, there is a greater chance of animals getting pulled into the skimmer before finding the FrogLog. If regulations allow for only a brief shutdown period for the pump, set it to cycle off at dusk, as this is when animals become active. Using the recommended number of units based on pool size will provide the best coverage. How many FrogLog units should I use? The chart below should be used as a guideline. If you have a problem with mammals (mice, chipmunks, moles, squirrels) the higher number of FrogLogs should be used. When a mammal falls into a pool, they can quickly become exhausted from swimming. The sooner they find an escape route the more able they are to climb up the FrogLog and escape. 1. The pump and filter are run at night. 2. Chlorine levels are kept high. 3. The number of animals found in your pool is substantial. 4. Small mammals (mice, chipmunks, etc.) are the main concern.